Eddie 5's Story . 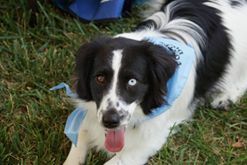 . .
Eddie was found as a stray and placed in a Delaware shelter where he was posted as a 10 month old Springer. MAESSR came to his rescue and Eddie spent a few nights with two other families before landing with his current foster mom and canine foster brother. Sweet and cuddly, Eddie is an amazing houseguest who has done wonderfully with his big foster brother. This boy has a huge personality packaged in his small 30 pound body. While he might not be a Springer by blood (his foster mom believes he is a Border Collie-Corgie mix), he has a Velcro Springer mentality. Eddie does not go far from his foster mom while at home. When she is on the couch, he usually is found on her lap, snuggled up right next to her, or on the floor close by. At night he snuggles closely with his foster mom in the big bed. He is such a loving boy! Eddie is very healthy and has wonderful pearly white teeth! He did have a not-so-common intestinal parasite which he has been treated for, he was a bit dehydrated when giving his urine sample, and he is a few pounds over his ideal weight of 29-30 pounds. Wonderfully behaved at the vet, Eddie only squirmed when an injection burned a little. The vet suspected that Eddie is a bit older than 10 months, most likely a year old at least. In order to help Eddie keep hydrated, his foster mom is feeding him an even ratio of canned and dry food. At meal times he eats slowly, being more concerned with where his foster mom is and if his foster brother's food is better than his. Eddie doesn't show any sign of guarding his food, but he did tell his brother, "Not happening, buddy" when he sniffed at Eddie’s dental chew one night. Eddie has not had any accidents in the house. He hasn't really given his foster mom any signals that he has to go out yet. He tends to wait until his foster mom and brother head to the back door and runs out when the door opens. He loves running in the yard and is vocal when he wants attention or wants to play. When inside, Eddie loves playing with soft stuffed toys (he did enjoy gutting a gator toy) and, of course, snuggling. When his foster mom is at work, Eddie spends the day with his foster brother in the living room. He will get into things if he has a way to “step” up to the counter or table. Once, when separated from his brother, Eddie got up on the dining room table and knocked a few things off. Otherwise he has not counter-surfed…he can’t without a chair to help him up! He does know “sit,” but doesn't seem to know “down” yet. Eddie is still very much a puppy and still learning proper Springer etiquette. Potential adopters should know that MAESSR only places puppies in homes that are committed to training and bonding with the pup in obedience classes. Puppies require a lot of care, attention, and patience, and they do chew on things! The decision to get a puppy and raise it to be a healthy, happy, and well-adjusted dog is a serious commitment. To reinforce this commitment, MAESSR requires all adopters of dogs one year old and under to enroll their puppy in obedience classes within 60 days of adoption. Eddie’s a smart boy and should be an excellent obedience class student! On leash Eddie is okay, but not great since he pulls some. On his first walk he was very curious about everything going on around him, barked at anything moving, and wanted to greet every person who walked nearby. Eddie met a little girl around three years old and was very good with her. He also was excellent with a child around seven years old in one of his temporary homes. He was happy greeting dogs and humans during his vet visit. His foster mom hopes to get him to a friend's house with cats to see Eddie’s reaction. Reportedly he did great with resident felines at one of his temporary homes, but there was one instance when he did try to chase a cat that surprised him at another house he visited. Eddie traveled to the Maryland Springerfest where he got to be the host with the most and was voted MAESSR's newest ambassador! He was the star of the show, greeting everyone and checking in on each and every guest throughout the day. Eddie was in his element being a little social butterfly. He also was assisted into the pool, which he wasn’t too sure about, but got more comfortable with time... he did swim a short distance back to the step to get out. It’s hard to say if Eddie will turn out to be a water dog like the rest of the swimming Springers at the picnic. His personality and adorable looks captured many hearts at the picnic. Eddie will flourish in just about any home. 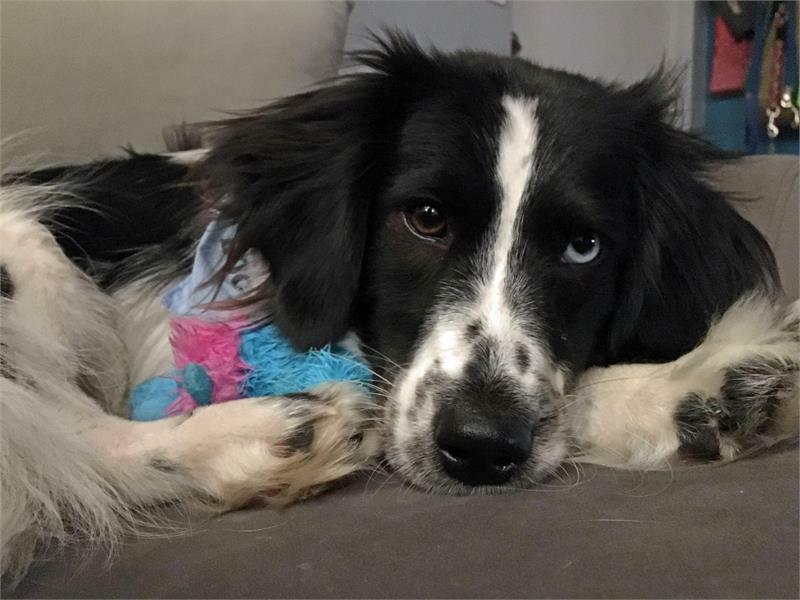 He does great with other dogs, and does look up to his foster brother, but his foster mother believes that he would be okay being the only dog…he certainly wouldn’t mind getting spoiled without sharing the attention he naturally attracts! Eddie has that joyful “Springer state of mind.” He is just so easy to fall in love with!